A cool new design, the Freedom 16 oz. Acrylic Tumbler can be used for hot and cold beverages - yes this is the really cool one everyone goes crazy for similar to the one sold by Starbucks. The durable double wall construction of this acrylic tumbler and the threaded lid with straw, make this a great tumbler for company events and outings. Add our candycane straw for a limited time beginning October 25th. Available in clear, blue, red, graphite, and green. Must be ordered in cases of 24. 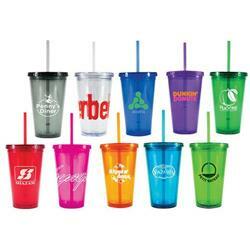 Too many custom tumblers and slurpy cups to choose from? Call our staff at Adco Marketing for help at 888-332-ADCO. On special now at 144 pieces! RUSH PRODUCTION AVAILABLE – 24 hours! Typical Imprint Area(s): Imprint area H x W x Wrap 3 x 3-1/4 x 9. Available Imprint Options: Second color imprint add $.60 each. Must be ordered in cases of 24.